Last minute trip on a recent afternoon Bryan and friend from Kansas City had lots of fun catching fish species they never caught before including the star of the trip a 5 lb. black drum������. 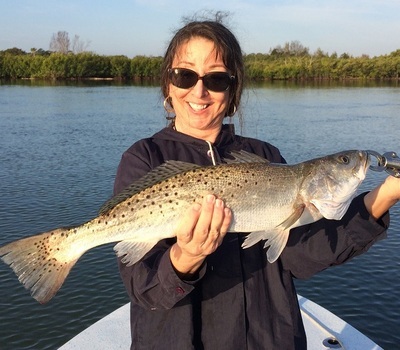 But Dr Ed got a speck almost as big between all the fun jacks and sheepshead�����. Almost always some surprise catches on most trips in the backcountry, this time it was a serious 4 lb. Florida pompano caught by Frank�����. 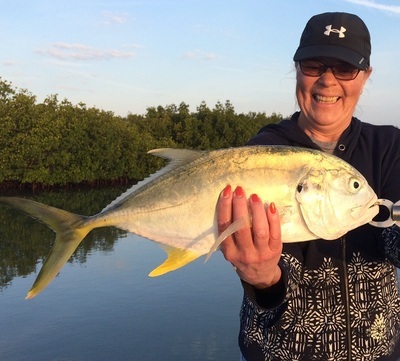 Jack crevalle are widespread through the waterway in spring, if they are swimming, they are eating and hard pulling making for always fun rod bending, Zak battled this one on light tackle������.